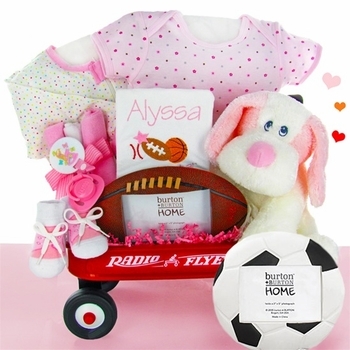 Here's a cute gift that combines sports and a sweet puppy into a fun and playful mini wagon. Babies love to cuddle with soft, plush puppies, and this one is sure to become a favorite! If you like, we can personalize the cotton baby bib for an extra thoughtful and memorable gift. NOTE: Photo shows (2) frames for demonstration purposes only. Gift comes with (1) frame.